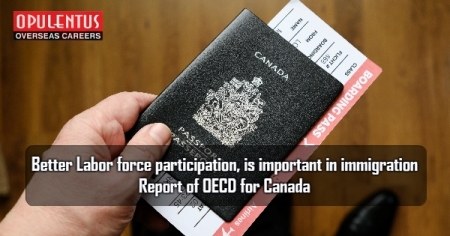 A Report of the Organization for Economic Co-operation and Development says that Canadian economy would benefit with the participation of more women, youth and senior professionals into the work force. Canada needs to invest more in child care, and also increase its retirement age. It must also matching qualifications and experience of immigration applicants to specific skills needs. Canada has delivered a good outcome and pursues strong immigration policies. It can expect a fine economic growth and be fairly robust. Its real gross domestic product will grow 2.1 percent to be among the best in the Group of Seven industrialized nations. Moreover, Canada has made the right decisions in many areas. The most important fact is the participation of labor force, and immigration, which are critical areas, to offset a slow labor growth, owing to the retirement of baby boomer generation . There must be an inclusive growth. This will contribute to a productive economy. The policy of attracting more people into the labor market, getting more people to work for a long time, and increasing female participation will collectively bring a big effect. The participation of Canada’s female labor force is high in the organization, and the gender employment gap has remained unchanged since 2009. The female participation rate, is 61.3 percent and is 8.5 percentage points less than the male rate. The full-time working women earn 18 percent less than men in 2016.This gap is considerably large, compared to the OECD average. Additionally, there is a need forCanada toconsider to relate the eligibility age to life expectancy. Canada has a system of economic immigration which gives a priority to high level of human capital and earnings. There is a recommendation that Canada should make some broad changes in the selection process of economic immigrants. There is a need to give an extra benefit to factors which affect in finding good job matches. This would provide a better match to the applicants, having specific skilled work experience, to meet needs of an employer, and also get relevant job offers.